Product prices and availability are accurate as of 2019-04-20 05:25:29 EDT and are subject to change. Any price and availability information displayed on http://www.amazon.com/ at the time of purchase will apply to the purchase of this product. 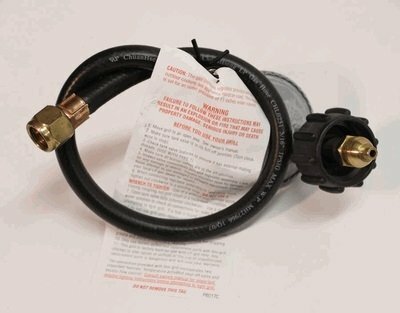 Do you need to replace the hose for your propane grill? This Broil Master hose should meet your needs. It has a female pipe fitting that attaches easily to liquid propane grills. With its sturdy construction, it will last for some time, thus eliminating the need for frequent replacement hoses. An included regulator will accurately manage the flow of propane. This hose will install simply and easily, enabling you to quickly return your grill to usefulness. Features: Hose and regulator with female fitting. Durable construction. For liquid propane grills. Simple, quick installation.